This Danainae belongs to a genus of butterflies that are called "Crows" presumably due to their generally drab brown or black wings. 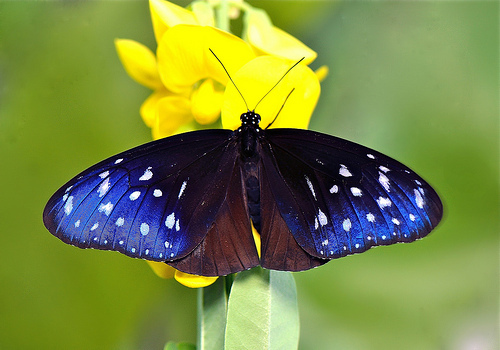 Many of the species are indeed black, dark blue or dark brown with white patches or spots on their wings. In Singapore, there are eight species of the genus Euploea that generally fall into these characteristics. At first glance, the Striped Blue Crow is no exception. The undersides of the butterfly are dark reddish brown with the usual white spotting. However, when the male of the butterfly opens and shows off its forewings, the beautiful iridescent blue forewings makes this species probably the most attractive of the "Crow" butterflies. The species is moderately common, as its caterpillar is able to feed on a number of species of lactiferous plants that gives the caterpillar (and butterfly) some distasteful qualities that predators would avoid eating them. This male Striped Blue Crow displaying its shining blue wings was photographed by ButterflyCircle member Lemon Tea Yi Kai.